Backed by a team of highly skilled and experienced professionals, our organization is engaged in offering best in class Sprint Color Plastic Ball Pen. Exotic range of Color Pens that we offer is as per the need of several schools, colleges, institution, offices and every sector all across the world. These are designed as to provide smooth writing with constant flow and are provided in various colors and finish. These are widely appreciated by our clients because of excellent results in exam and other sectors. Due to our proficiency, we are engaged in offering to our patrons Colored Promotional Pens. We offer this product in numerous designs that meet on consumers demand. 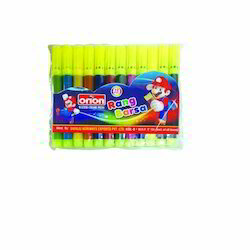 We are actively engaged in manufacturing and supplying next generation Coloured Pen. These great looking pens are highly popular in students for its bright color and smooth ball point. Developed from high quality cellulose acetate material, the barrels are unbreakable and can be availed in varied graphical designs from us.